Mmm! Looks good enough to eat. OOOHHH! I love that fuchsia-red color. Gorgeous! YUM! Lovely plum and I've just looked back through your serious time commitment for May Your sketches are great. I love your work and really enjoyed following along on your journey, Everyday in May. So it's the last one of this series... What's next for you? Whatever it is - I can't wait to see it! debra, i think i've put on 2 kilos just looking at your edms for may. they're so amazing, not just for their detail but with the simplicity in the way you compose your pictures. Awesome Debra! The coloration is PERFECT! Congrats on finishing. A great collection of for EDiM again. Beautiful! 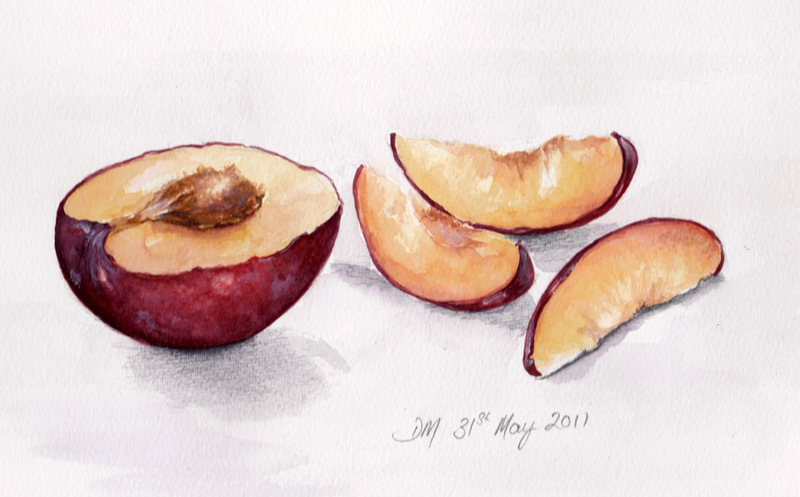 I came across your blog looking for drawings of plums and so glad to find so much more here!